dental implants can offer you a new lease on life! 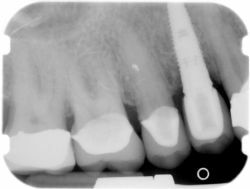 Top picture is the x-ray of the implant after placement. 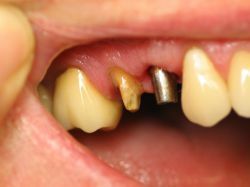 Left picture is the abutment in the mouth and the picture on the right is the implant with the final restoration crown. 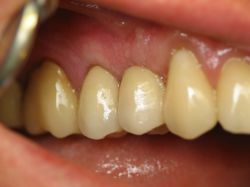 When permanent teeth are lost, regardless of the reason or number of teeth, can offer a “new lease on life.” They are superior to other choices because they are solid, secure, and aesthetic. After nearly 35 years of use, dental implants Colorado Springs patients have had a 90 to 95% proven success rate in appropriately chosen cases. A dental implant is a special surgical grade titanium post, manufactured to highly precise specifications, under strict sterile conditions. It is inserted surgically into the jawbone below the gum surface. With proper use of the newest anesthetics and medications you need not be concerned about pain. As the bone bonds to the post, it forms a secure foundation onto which your new teeth are then attached and shaped to match your mouth. The number of teeth being replaced will determine the best kind of restoration for you. Implants can help replace a single tooth, or a full set of teeth. If you have been suffering with partial or full dentures, or are missing teeth, or feel you need teeth extracted, do not hesitate to call to be evaluated for implants. Dr.Carter provides dental implants Colorado Springs residents feel comfortable trusting to improve their life and smile. Through careful evaluation and the necessary surgical procedure, he can transform your smile and how you use your teeth in daily life. At Northgate Dental, your options and care will be thoroughly explained to you and all your questions answered for the best dental experience possible. Dental Implants can replace one tooth or all your teeth. Review the following additional information about dental implants, and then contact our dental implants Colorado Springs office to schedule an appointment to your options and feel good about having the procedure! • To create meaningful, long lasting relationships with love, empathy and compassion. • To preserve integrity with steadfast moral character, ethical principles and resounding honesty. • To provide everyone with the opportunity to make life changing decisions that encourage personal freedom and joy.